Jesus grew up in the small town of Nazareth, but eventually left to proclaim the good news of the kingdom of God elsewhere in the region. When He returned, He was viewed by those who remembered Him, as the carpenter’s kid, as a carpenter Himself, as Mary’s son, as the brother to four other boys and as a brother to a couple of girls. I can almost hear the stories – “Remember that trough He built for our stable? Remember when His parents left Jerusalem without Him? He was always such an obedient child.” When in town, apparently for the first time since He hit the road, Jesus was given the opportunity to speak in the Saturday synagogue service and “astonished” the congregants with His teaching. Astonished as they were with Jesus, the found Him “offensive.” So Jesus healed only a few people, packed up the disciples and they all went out to other villages within the region proclaiming the good news of the Gospel. Why do you think the hometown crowd was offended by Jesus? 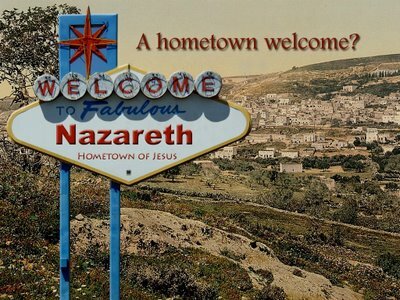 Why didn’t Jesus hang around Nazareth a little longer? How did Jesus’ approach for getting the good news out change beginning in verse 7? Please join me in praying for God to strengthen our faith and increase the presence of His kingdom when we gather for worship this coming Sunday. Also, please pray about how you may be able to help us reach out to our community during Old Home Day and through our summer Kid’s Camp. You can read more about those ministry opportunities in the right hand column. So far in Mark’s gospel, we’ve seen Jesus unpack the Word of God as if He inspired it, heal people of all kinds of sicknesses, cast out demons, control the weather, and overcome the spiritual forces of evil. Wouldn’t you think, by this time, that anyone reading Mark’s gospel would recognize that Jesus is God? And if not, what does He have to do to convince them? Raise someone from the dead?! OK. That’s just one of the things Jesus does in this week’s passage. But, believe it or not, Jesus’ command over life and death is not the main point Mark wants us to take away. Mark wants us to see that the divine power of Jesus is worthy of faith. It is a sad thing, however, that no amount of proof will convince some people about Jesus. Many think they already have everything they need and have no room in their hearts for Jesus. Others think Jesus is foolish, laughing and scoffing at Him and His followers. Some want to be around Jesus for what Jesus can get them, rather than for Jesus Himself. Even many Christians lack faith in Jesus when things aren’t going the way they want. We see all of these responses to Jesus in Mark 5:21-43. Take a couple of minutes to read the passage and think about the various reactions to Jesus by those Mark mentions. What relationship do you notice between fear, the power of Jesus and faith? 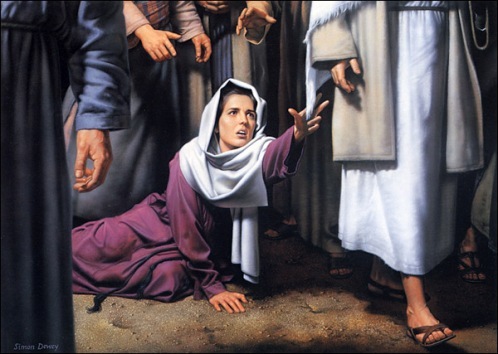 How are the circumstances related to Jairus and “the woman” similar and yet very different? Do you trust in Jesus alone? If not, what more will it take for that to happen? Please join me in praying for God to strengthen our faith and increase the presence of His kingdom when we gather for worship this coming Sunday. The resurrected Jesus’ last words before His ascension indicated two things that will happen to those who are His disciples once He is gone. He said, “you will receive power when the Holy Spirit has come upon you” and “you will be my witnesses.” All Jesus’ disciples will truly receive the Holy Spirit and they will truly be witnesses to Jesus. These are not imperatives – “you shall,” but rather are indicatives – “you will.” In other words, He is not commanding us to be witnesses to Jesus but is saying that we, in fact, will actually be witnesses to Jesus if we are really His disciples. Jesus disciples today still will be (indicative) witnesses and that is at the heart of this church’s missions ministry. Everything our missions’ ministry is involved in is centered on witnessing the good news of Jesus. That witness is not in Judea or Samaria, but it is in Goffstown, Greater Manchester, New England and places all around the earth. Ten percent of our church budget goes to support ministries that witness Jesus. And many of you are not only direct witnesses where God has placed you, but also on behalf of our church, as we reach out with the Gospel in our own community. There are many opportunities for doing so as a church body, but in the near future we really need your help in two ways in particular. 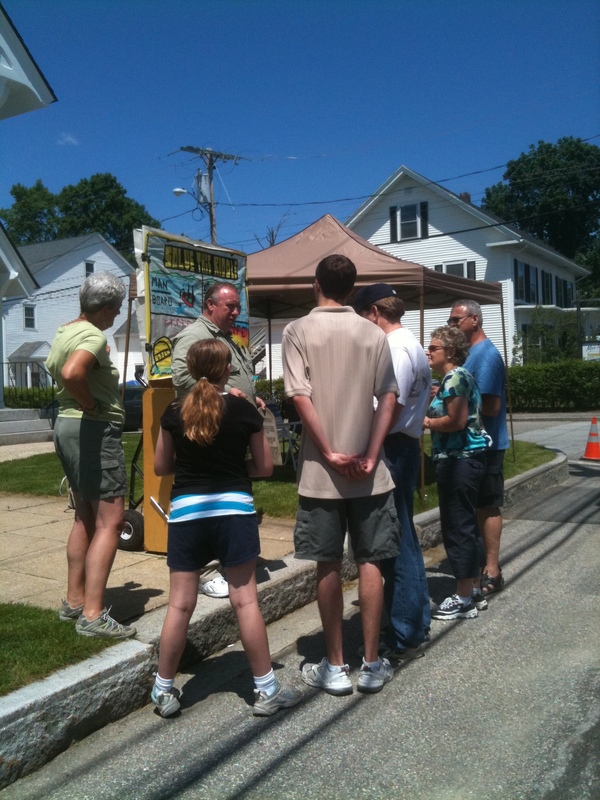 Will you consider helping our ministry to Goffstown during Old Home Days, on June 2nd and/or during our vacation Bible school, from July 30 – August 3? I think we will be amazed at what God does through us through these two ministries of our church to our community. Being a witness to Jesus is something that can seem intimidating for some of us as we put undue pressure on ourselves to perform. But remember, although Jesus commanded us in the Great Commission (Matthew 28:18-20), He also tells us in that same commission (v. 18) that it is by His authority on heaven and on earth that we will be His witnesses. Our anxiety is removed when we realize that it is by the power of the Holy Spirit that God will in fact make us witnesses. God will open the doors of opportunity and provide us with the words that are needed in His perfect timing. It is all hinges on our faith – trusting in Jesus and stepping out where God has placed and called us, confidently knowing that we will be Jesus’ witnesses. The recent killing of a local police chief and the shooting of four other officers was a stark reminder of the presence of evil in our world. One need only unfold the newspaper, open a web browser or turn on the television to find ourselves face to face with evil. As soon as it is put down in one place, it rears its head in another. It is all around us and we can’t seem to get rid of it. In this week’s passage, we see Jesus confronted with the presence of evil. A man, possessed with many demons, practically pounces on Jesus as he pulls up on the sleepy, eastern banks of the Galilee. So much for a rest after the stormy seas of the previous passage. This account is shared in Matthew and Luke, but Mark focuses on this one particular man (others were present) and the circumstances surrounding his interaction with Jesus. Mark’s account is quite significant in revealing not only who Jesus is, but how the effects of evil are gradually overcome now and completely at a time to come. What types of evil do you see in the world today? Where do you see it? 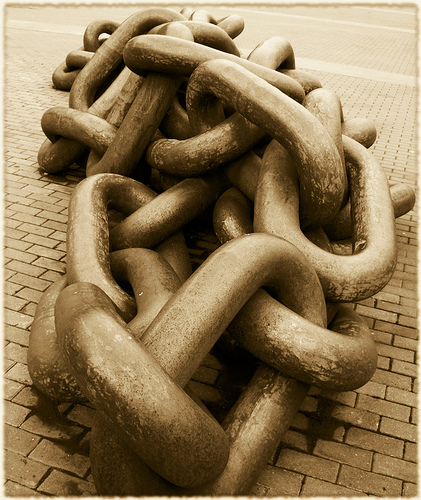 What does the passage tell us about our own ability to overcome evil? What did Jesus ask the restored man to do, that differed from the instructions He had given others at this point in Mark’s gospel? What an exciting story! Jesus encourages the boys to sail Him across to the quiet side of the Sea of Galilee, only to drop them in the middle of hurricane force winds and seas that spill into and are filling up the rocking vessel. All this is happening while He’s taking a much deserved nap on a cushion at the back of the boat. This eyewitness account probably came to Mark from a very scared Peter. Psalm 107:23–32: 23 Some went down to the sea in ships, doing business on the great waters; 24 they saw the deeds of the Lord, his wondrous works in the deep. 25 For he commanded and raised the stormy wind, which lifted up the waves of the sea. 26 They mounted up to heaven; they went down to the depths; their courage melted away in their evil plight; 27 they reeled and staggered like drunken men and were at their wits’ end. 28 Then they cried to the Lord in their trouble, and he delivered them from their distress. 29 He made the storm be still, and the waves of the sea were hushed. 30 Then they were glad that the waters were quiet, and he brought them to , desired haven. 31 Let them thank the Lord for his steadfast love, for his wondrous works to the children of man! 32 Let them extol him in the congregation of the people, and praise him in the assembly of the elders. Not only does Mark want his readers to consider who Jesus is. I believe the point of the passage is the following: When we realize who Jesus is and have faith in Him, we will trust Him, even if our obedience leads us into storms. How do get the kind of faith needed to trust the Lord no matter how great the storms of life? That is the question we’ll be exploring on Sunday morning. Why did the disciples seem to rebuke Jesus while He was sleeping? People often fear death, being alone, failure, a lack of control in their own lives and in the lives of others, and the unknown. What is your greatest fear? Please join me in praying that God will grow us and His kingdom when we gather for worship this coming Palm Sunday.